How Do I Keep People from Petting my Service Dog in Training? – ComeHereBoy! How Do I Keep People from Petting my Service Dog in Training? Since my dog, Bronco, is an eye-catching German Shepherd, I often have people approach and ask me if they can pet him (or don’t even ask, just try to drive-by pet). I guess I can’t blame them. He looks like a large, cuddly, silver fox. The problem is, I can’t have people pet him. He’s a great dog, but it’s a problem to have him distracted. It’s always a worry that a child might scream in his face or step on his feet, and though he’s tolerant, I can never be 100% positive how he might react. On top of that, I have to have him paying attention to me – no one else. 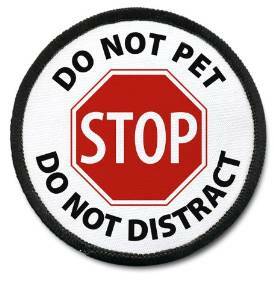 You might think that people would see vest patches that say “DO NOT PET” and leave your dog alone. Unfortunately, many people seem to become blinded by the cuteness or novelty of your dog standing in line in front of them in the store. Before you know it, these people are trying to elbow past you to pet your working service dog and you’re gaping like a fish, unsure of what to say to a person who has forgotten common courtesy and how to read. So how can you tell people to leave your service dog alone without coming across as rude? Honestly, there is no one thing you can say that will always come across as nice to all people. However, there are some quite a few different things you can try and see which ones you’re most comfortable with. Keep your vest uncluttered and simple. DO NOT PET should be huge and high contrast (red/black words on white, white words on red/black) or it can be a pictograph. Here’s a good example. There are also leashes like this that might catch someone’s eye if they miss the vest. People don’t want to pet a Doberman as often as a Golden Retriever. Your breed choice can factor in to how often people bother you. If you have a Catahoula Leopard Dog, expect have people bothering you every five steps asking you what breed of dog you have and wanting to pet it. Something that is a good idea to teach your dog is to totally ignore strangers petting them unless you give them word otherwise (usually a release word like “free” or “go ahead”). And by ignore, I mean your dog doesn’t move a muscle. No tail wagging, eye contact or anything. This can help turn people off. Body blocking is when you move to stand in front of your dog, so a person can physically not reach the dog. This is what I use most often, so I have time to say “Please don’t pet my dog.” Otherwise, people are often petting before I can think of something to say. Don’t be afraid to say “Sorry, no. Have a nice day.” and move away quickly if you need to. That way you don’t have to deal with any awkwardness or continued presses for petting. Really, don’t be afraid to just walk away! Even then, these type of people would probably ignore it. This is also useful in cases where a store owner confronts you and insists your dog is not allowed. Many people carry mini laminated cards of the ADA law (or state law, in the case of SDiT) just in case. People are less likely to bother you if you don’t look them in the eyes. Avoid eye contact or smiling at people and they’re more likely to leave you alone. Don’t feel bad about it! No one at the store will care. Try to walk with purpose. Make a list before you go to the store and plan out where you’re going. If you can avoid browsing while people are nearby, do it. This will cut down on your stops a lot. Be prepared to ignore glances, smiles and stares and to speed up subtly when people look at you. One of the very best things you can do is to practice. Practice with family members and friends until you have quick responses that will be able to shut people down quickly and politely. Have your family randomly surprise you by trying to pet your dog very insistently. A person tries to make eye contact with you and moves in as if to start talking with you or to “drive-by” pet your dog. A child tries to push past you to pet your dog and the mom just smiles and doesn’t do anything. Remember, if people choose to be mad, that’s on them to deal with. You can’t make someone feel happy or mad, that’s their choice. You have the right to have an uninterrupted store trip just like everyone else. Move on if you can, if not, ask for a store manager. Managers are happy to kick out rude people and accommodate you, in most cases. You also do not need to educate anyone about service dogs (except in some cases the store owner, if you feel like it). It’s very unlikely someone will follow after you, so don’t be afraid to continue on your way. The person will get over it. You and your dog’s time and safety is more important than how people feel about not being able to pet your dog. 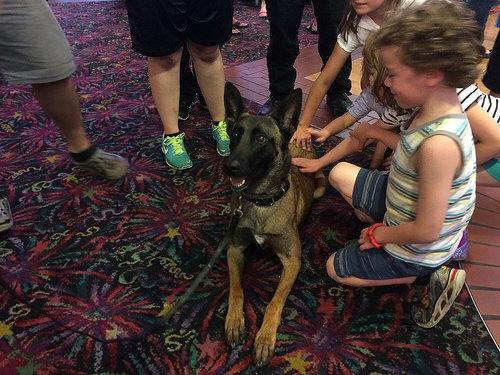 What are the situations you’re afraid of encountering when you start taking your service dog in training out in public? The petting is a big problem for me. I feel rude telling people to stop. I’ve even had an anxiety attack due to it happening once at a grocery store when someone behind me in line started and as I was asking them to stop the grocery clerk started so I switched lanes and the person behind me followed over. As far as explaining the law I have found these cards very helpful. They are small business card size and you can hand them out and keep on going. Oops I forgot the link. I have those same cards. I bought them when I bought my vest. Thankfully I have not had anyone confront me about my dog because the vest clearly identifies her as a service animal, but I keep the cards in my wallet and my car always so I am prepared if/when it does happen. I like that they have the phone number for the Department of Justice, so if I am feeling brave enough, I can tell the manager/whoever to call that number if they don’t believe me. Here is one thing I trained my dog to do to prevent people from petting her: I taught her to sit literally right between my legs. I step my feet apart a little farther than hip distance and use the command “step up” for her to position herself between my legs and sit/stay. I have recently been using it when I am waiting in a line or stopped to read a product label or something. I found that people are far less likely to reach between my legs to pet my dog than if she is just sitting next to or behind me. Now that she has that part of the behavior solid, I am starting to teach her to walk forward with me while staying in between my legs, so that when we are in a long line that is just inching forward she does not have to move back into heel position on my left in order to take just two steps forward and then get back in between my legs. I think that teaching her to walk forward with me while staying in between my legs will be very useful, especially with many people around. So that is my suggestion for people who, like me, are unable to appropriately tell people to buzz off. When I have to confront people, it can trigger a panic attack. So far since using this between my legs behavior, not one person has been able to pet my dog, and even though some people still ask me (I rehearse saying “no thank you, she is a working service dog, she can’t be distracted.”) , they are basically physically unable to pet her without my permission. And as an added bonus, my dog who loves people, is reminded not to pay attention to people who coo at her while she is working. Also, part of her job is to remain in physical contact with me when I am in a crowd to keep me calm, so this behavior accomplishes all those things at once. The service dog that works great for my allergies is a standard poodle. The attention that she garners every day I am in public is rather high. What I would like is for people to understand I am disabled (I also have a white cane,red tip) and have 5 disabilities. Just common courtesy would work for me and effective parenting techniques so I do not have to continually monitor the poor behavior of little ones. No matter what I say and as kind as I say it, people will continue to behave in dangerous and annoying ways as I continue my life as a person who benefits from the use of a service dog. I send positive energy to all who have their lives enhanced by these amazing four footed companions and hope that other people with disabilities can encounter the improvement that many of us already enjoy. My best to all. And REMEMBER: Dogs need to learn to work with distractions too– so distraction-less training would not be very effective in a real emergency or medical alert when some serious distractions would arise!!! I’m so glad you posted this article! We had a rough time during our first visit to a busy airport. So many kids/adults reaching their hands out every few steps. I didn’t know how to say “no” and the end result was a panic attack, during which, a women proceeded to ask me about his breed. I missed my flight due to the panic attack, had to pay a rebooking fee. We’re trying again tomorrow, armed with these tips! Thank you for this article! Yesterday I tried out a new church and I decided to leave the service a few minutes early so I could easily get to my car. Knowing I can’t handle groups of people moving about and walking. I had no idea there were children playing in the court yard and I felt ambushed when a very large group of very young children ran up to us and started petting my dog. I had a panic attack! The person in charge of them was no where to be found. I use a walker and my dog was great and he helped us to get out of there and to the safety of the car. That really blind sided me I never expected that. I’m so very thankful he is a gentle giant of a service dog. He is an 80 lb. standard poodle. I’m just wondering if I need to put a muzzle on him if that would alert people to leave him alone. I really do not want to go to that extreme, but even though he is very well trained, he is afterall a dog with great big teeth. One of the children could have provoked him and it might not have ended well if you know what I mean. It would be devastating for something like that to happen not only for the child/adult, but my dog and I. Thank you. I have been in this position one too many times, especially when both my husband and I have PTSD and each use a service dog. Its rare enough to spot one service dog let alone two, now three with one being in training, at once! Sadly an animal’s beauty is it’s curse. My maltese and in training doberman puppy with my husband’s german shepherd husky mix; we certainly turn a few heads. We’ve had people on multiple occasions flat out ignore us when we ask them to leave the dogs alone. Sadly, we easily slip into an anger outburst telling them to F off or else we’ll call the authorities since distracting service dogs deliberately is considered assault, reckless endangerment, and, even possibly, life threatening. We’ve been stalked, which is a big trigger for both of us, as well as strangers being openly belligerent and cruel when they don’t agree that dogs can be allowed in any place of business. There were a couple times we used our ADA cards to help shop owners/managers know their own rights when it comes to people’s fake or ilmannered service dogs. Businesses can be victims too, when frauds extort the service dog rights and laws without legitimate medical need of such a valuable tool in order to take their PET with them. Sickens me. Now I’m ranting so I’ll bring this to an end. I have a morkie.she is a toy Maltese/Yorkie mix by good breeders. I am really sick, multiple illness’s.lifethreatening-ms and minor to extreme.we got her at 8 wks named her Rey star wars.her birthday is May 4.i have nerdy teenagers.1.3oz ball of white beige fur. She never pooped inside.house broke herself.i almost died a year my husband got her for me.it was bad.3rd time (reincarnated 🐈) she keeps me from committing suicide.i am on a ton of meds including strong pain meds.she has a total chill attitude and fits in with each family members hobbits.my teens are lazy.i can’t drive so we are inseparable.i always talk to her like a person.i don’t lie that she is really smart.i can teach her a skill one time and she learns it.she protects me on the road with cars and I protect her from everything else.she hears them and pulls over looks both ways before crossing the street.i double check.i have a problem with finding harnesses that fit her and have big enough patches.she is a forever puppy.toy Maltese will look and act like a puppy even in older years.people ask to pet her.kids are more polite than adults.i frequent target.their employees know us. We either get the look of aw so cute,to how can a 🐕 that small be a service dog snubbed.we get the confused patron look do I go around turn the isle stare annoyingly look.i have had stupid millennials try to break her attention and run away to prove fakers. My dog goes to grocery stores, restaurant’s most ppl don’t know she is there til the point of almost hitting her with a cart.then I have to pick her up and then there’s that snubbed look again.i just say excuse us.i have had episodes of my symptoms and shell signalling by biting gently my pants leg or arms up to be Carried.ive sat on the floor her on my lap staring at ppl going by.i could write a book in the year I started.my father is a vet 🐕.i researched everything.i couldn’t handle a big dog.how do we put ourselves first and not stop every two seconds.i find horse blinds work best.i feel like getting a doggy diaper bag embroidered with if you pet my dog,can I pet your child? I have fatigue,a cane, tremors.rey gets stuff dropped so many times. New. World frustrating tasks.it was hard enough convincing family thank you for my rambles. Previous PostPrevious How Do You Know if Your Dog Would Make a Good Service Dog?